Located as we are right next to the start/finish of the Mountainbike Trophy event, a cosy ambience of enjoyment awaits you for the time after your last – and before your next – tour. Explore the Salzkammergut without wearing yourself out! 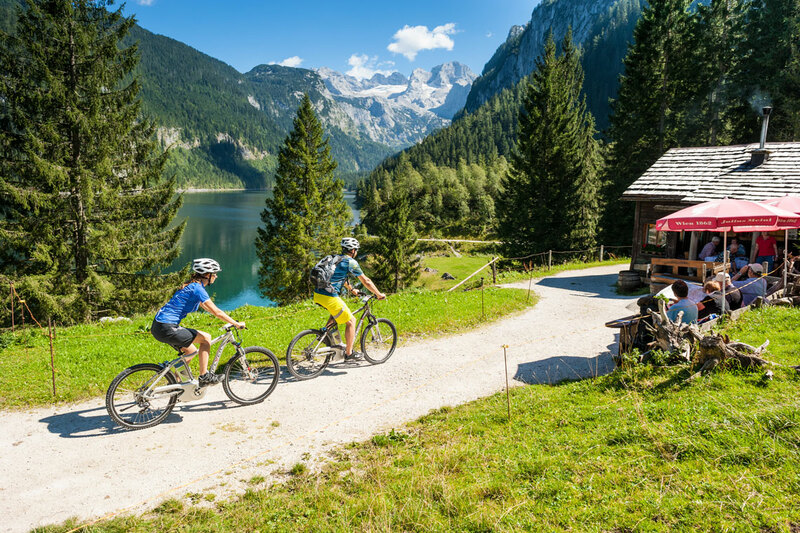 Discover Dachstein in the Salzkammergut effortlessly by e-bike and pay a visit to the many sights in the region. The “On Your E-Bike” package combines sport with nature and culture! Accommodation in fully equipped rooms with shower or bath, WC, TV. Some rooms have a balcony. Use of the Swiss stone pine sauna and whirlpool is included. Prices include all charges and taxes. Cable car trip up the Krippenstein and walk to the 5fingers viewing platform, the Welterbespirale viewing platform, the Dachstein shark etc.